A new generation Korean face mask combines skincare with gemstone therapy, aromatherapy and colour therapy to achieve multi-sensory results. 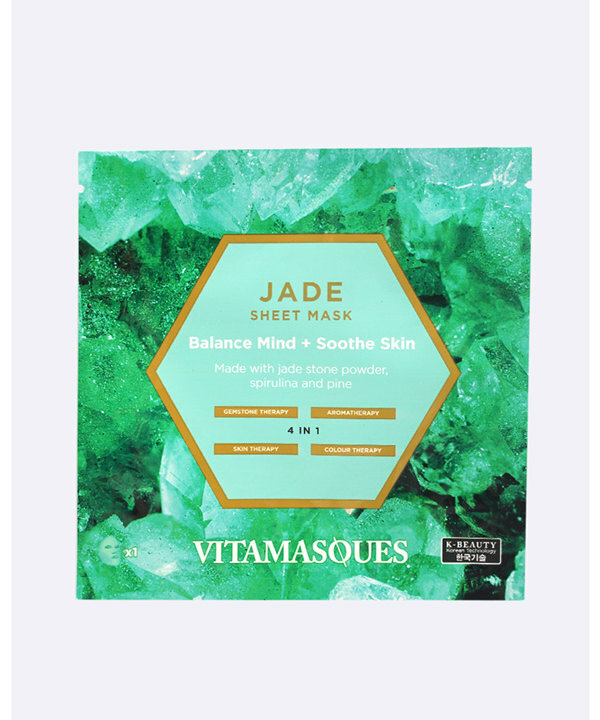 This green coloured mask contains jade stone powder and bergamot essential oil to help you to balance your mind, at the same time, the green plant extracts, such as spirulina and pine help to soothe your skin. The Gemstone collection is also completely Free of Mineral Oil, Phthalates & Sulphates, Animal Cruelty and Vegan-Friendly. Jade, also known as the “Dream Stone”, revered for its access to the spiritual world it helps to gain insight, encourage creativity and problem-solve. It’s also been used to protect and assure long-life as a powerful healing stone. The first of the 4-in-1 therapies is Colour Therapy which helps to align your chakras to different wavelengths depending on which colour the mask contains, Chromotherapists believe that different colours in the spectrum correspond with the body's inner vibrations, our new Gemstone collection aims to relax, balance and recharge your mind as well as nourish your skin. Secondly, the Aromatherapy treatment utilises plant extracts and oils to improve psychological and physical well-being while applying the sheet mask, which forms part of a usual skin therapy routine that can nourish, hydrate, restore and soothe your skin. Gemstones are proponents to facilitate healing in certain ways depending on which stone extracts are included, this is a practice dating back 6,000 years to the ancient Sumerians of Mesopotamia. As well as ancient Egyptians who were the first people to adorn themselves with crystals with the intended purpose of warding off illness and negative energy. In modern crystal-healing therapies most notably in China life-energy known has chi, and in Hinduism and Buddhism, the concept of chakras use crystals and natural gemstones to improve your wellbeing and protect your spirit from negative energy. This collection is the perfect self-pamper, all in one mind and body treatment for balancing and treating your skin. Aqua (Water), Dipropylene Glycol, Glycerin, Alcohol, PEG/PPG-17/6 Copolymer, PEG-75, Butylene Glycol, Paeonia Suffruticosa Root Extract, Centella Asiatica Extract, Panthenol, 1,2-Hexanediol, Carbomer, PEG-60 Hydrogenated Castor Oil, Chamomilla Recutita (Matricaria) Flower Extract, Glyceryl Caprylate, Potassium Hydroxide, Ethylhexylglycerin, Allantoin, Citrus Aurantium Bergamia (Bergamot) Fruit Oil, SpiruLina Maxima Extract, Nephrite powder (10 ppm), Pinus Densiflora Extract, Thuja Orientalis Extract, Chamaecyparis Obtusa Leaf Extract, Disodium EDTA, Phenoxyethanol.